“We remember” – the 13th international judo tournament among the police and the army was held under this slogan on April 13 in Moscow. Athletes from Austria, the Czech Republic, Greece, Belarus, Lithuania and Russia dedicated their fights and victories to their dead colleagues. A charity event was timed to the tournament – the families of the dead heroes were given car keys. The correspondent of “MK” also watched the tatami fights in honor of the dead security officials. The tournament was preceded by a ceremonial laying of flowers at the monument to the dead law enforcement officers, which is located on Trubnaya Square in Moscow. Among those heroes who were recalled were Colonels Andrei Ivanov and Yevgeny Velev, Senior Lieutenant Alexander Ochirov, Ensign Vitaly Matytsyn, Senior Sergeant Alexander Ivlev. They died during the second Chechen, all awarded the Order of Courage posthumously. Among the fallen heroes there are a lot of employees of the interior, the FSB, the FSO and the Emergencies Ministry. From the first international judo tournament among the police and the army in 2007, a tradition was born – to provide material support to the families of the deceased heroes. So, in 2007, the organizing committee provided targeted assistance to more than 600 families of deceased security officers. In 2019, seven families of fallen power structures received the keys to passenger cars. However, as noted by State Secretary – Deputy Interior Minister Igor Zubov, this is only a small fraction of the gratitude that the fallen heroes deserve in defending peace in their country. The sons of some of the dead heroes chose military service. For example, Andrei Ivlev, son of senior sergeant of the Ministry of Internal Affairs Alexander Ivlev, who fought to the last bullet from the stalking thugs near Khankala in September 2000. Andrey, like his father, became a police officer – he serves in the patrol and patrol service in Vykhino-Zhulebino. Andrey admits that he is proud of his father and will try not to confound his feat with his conscientious service. The tournament itself was held in an uncompromising struggle. Even at the qualification stage, an unexpected intrigue ensued – for reaching the final, which Russian judo fighters have already gone through, the Belarusians and the Japanese argued. Only a super reception brought victory to the fighters from Belarus and the opportunity to fight in the final with Russian colleagues. Before the final bout, tatami warmed up fights for “bronze”. Angered by defeat, Japan decided to get even with the ambitious police team from Lithuania. And the sports anger of the Japanese yielded its fruits – the Lithuanian security forces yielded to their counterparts from Japan with a crushing score of 4: 0. To take the bronze medal, the police and the Land of the Rising Sun left only one formal victory. Alan Tekhov from Lithuania admits: the Japanese are a tough opponent, very technical and explosive. The final bout in the heaviest weight category – over 90 kg – as expected, was dictated by Japanese athletes. As a result, the Lithuanians failed to even soak the score – 5: 0 in favor of Japan. In the Russian couple – the Ministry of Internal Affairs of Russia against Rosgvardia – the dispute over the bronze initially retained intrigue. The first two matches were equal. However, on the third pair, the team of the Ministry of Internal Affairs of Russia pulled ahead and no longer missed its victory. The strongest came together in the final – the police from Belarus and the team of the Russian section of Interpol. From the very first pair an uncompromising confrontation ensued – no hints of “dancing” on the tatami, only a high tempo, a hard clinch, grabs and throws. The first fights brought the Belarusians a difficult, but still a victory. 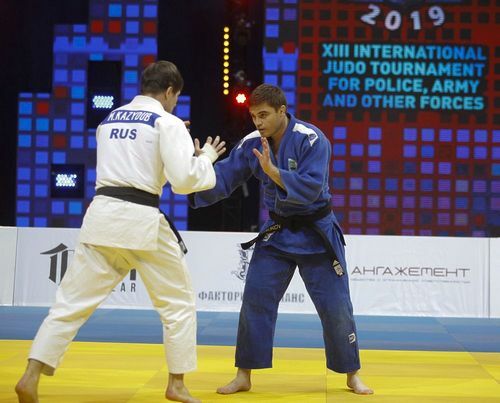 On the third pair, the Russian Interpol sparked up an intrigue – a Russian judo player unexpectedly threw in a tatami of a Belarusian colleague and earned a score in the piggy bank of the Russian team. It seemed that now the Russians will turn the meeting in their favor. But the Belarusian policemen made it clear in two victories in a row – the lost score is just an accident. Now the team of the Ministry of Interior of Belarus is the gold medalist of the XIII International Judo Tournament among police and army. By the way, starting next year, families of journalists killed in “hot spots” will be able to rely on targeted assistance. So the Organizing Committee decided to honor the memory of media representatives who, along with the security forces, are working on the front lines.